In addition to offering traditional linear channels and VOD content, Comcast’s X1 platform now offers Netflix, YouTube, Sling, Pandora, and other apps. In addition to aggregating all this content on the STB, the company has developed a powerful solution to quickly onboard video streaming partners without the need to write client app software. 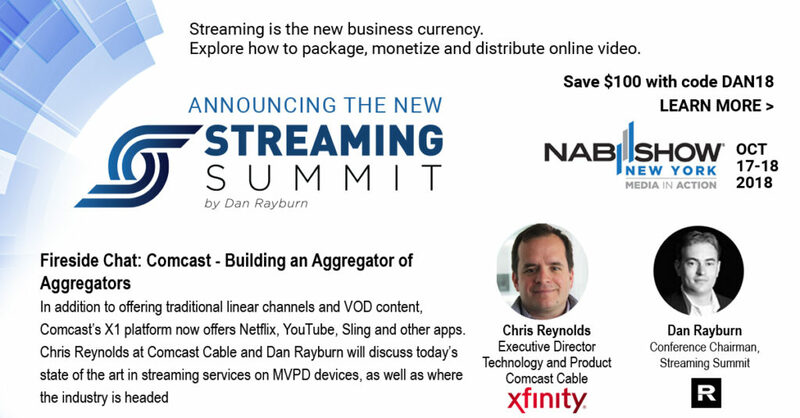 At the Streaming Summit, taking place as part of the NAB Show New York on Oct. 17-18th, Chris Reynolds, Executive Director, Technology and Product at Comcast Cable, will join me for a keynote fireside chat to discuss today’s state of the art in streaming services on MVPD devices, as well as where the industry is headed when it comes to aggregating content.